wooden block. Concept for property ladder, mortgage and real estate investment . Shrinking supply of homes for sale. This continues to be a problem primarily affecting the entry-level market. Prices could be driven up due to a low supply of homes for sale. Fairly static mortgage rates, expected to rise in 2018. 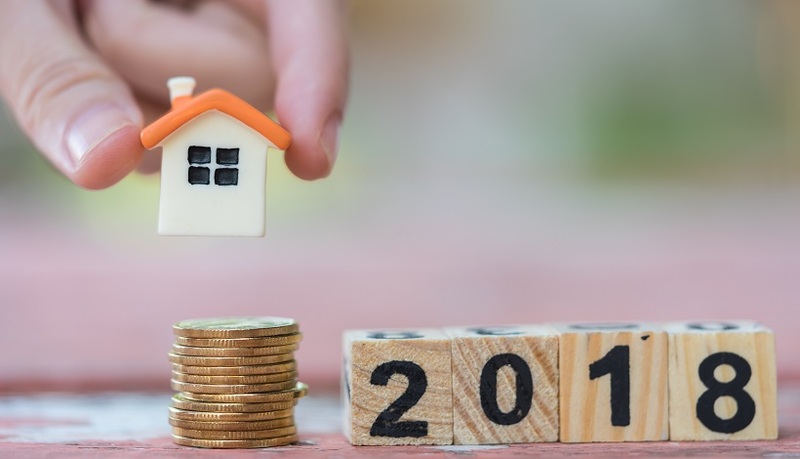 Real estate entities conducted their 2018 forecasts shortly before the tax bill passed. The bill includes provisions such as caps on property tax deductions and mortgage interest. These provisions may impact the housing market. Projections may fail to reflect the impact multiple provisions will have on the housing market. Experts have varying opinions on what to anticipate with the new law in effect. Some predict housing prices will be slower to rise. While others predict the market may become easier for first time buyers to enter. Yun suggested there’s an unbalanced relation between shortage of supply and overall demand. In his opinion this is the biggest impediment to sales. Over recent years, new home constructions lagging pace are creating a blockage in housing turnover. Yun predicts a slow and steady increase in mortgage rates. Ones with the 30-year-fixed-rate average will rise to 4.5% by the end of 2018. Realtor.com director of economic research, Javier Vivas, has more conservative predictions than Yun. Vivas predicts a 3.2% rise in home prices. He believes higher-priced segments will receive the most consequences of the slowdown. Due to the larger number of buyers than homes for sale, entry-level homes will continue to increase in value. Inventory will be restored to positive territory by fall – nationally year-over-year. Mid-to-upper-tier prices will receive majority of the growth. Some cities are expected to experience inventory recovery first. These cities include Kansas City, Nashville, Detroit, Boston, and Philadelphia. The most sales growth will take place in southern markets. These markets include Little Rock, Dallas, Charlotte, and Tulsa. Vivas and Yun share similar predictions about the 30-year fixed mortgage rate. Vivas believes it will average 4.6% and reach 5% by the end of 2018. Richardson predicts the 2018 housing market will be primarily shaped by inventory. There has been no significant increase in starter home inventory since 2011. The shortage of homes available on the market will cause faster sales. She forecasts 30% or more of homes on the market will sell within two weeks. Richardson describes the term, “urban suburban,” as a new and growing stereotype of a suburb driven by wealthier millennials. These areas include features such as highly rated schools and prime location for an urban lifestyle. Helps millennials and baby boomers connect. Group home buying support tool. This App assists with the development of nontraditional home buying and cohabitation. Svenja Gudell is a chief economist at Zillow. Richardson and Gudell both predict inventory will continue to be a major concern in 2018. Gudell predicts a consistent, but modest pace increase in home prices. Zillow collected data from 100 economist and housing experts during a recent survey. The survey projects prices to increase 4.1% in 2018. As of September, the nationwide market supply of homes has decreased by 12% over the last year. Home prices are commonly out of reach for first-time buyers. The top third of home values consist of more than half of the homes for sale. So who is to blame? Suburbs will offer more affordable housing to attract a rising number of millennials. Current homeowners will decide to remodel over selling. Gudell anticipates home design to be driven by boomers and millennials. Looking to buy a home in 2018? Find San Jose Real Estate here. See what’s for sale nearby!